I thought I had an image of it in a book, but I can't find it now. Although "readable" and Henry's "own hand" aren't necessarily things that go together in my experience! I have a heck of a time trying to read his handwriting. Ya gotta love eBay! You can find ANYTHING there! 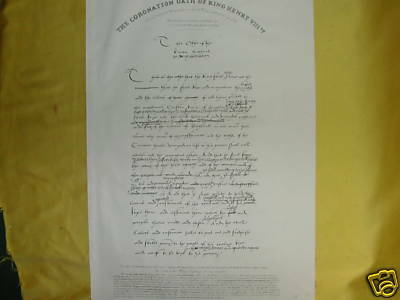 Even a facsimile of Henry VIII's coronation oath. A facsimile of the draft of the oath was engraved using the original document and printed by the lithographer Joseph Netherclift in the 1830s. I've searched Google Books, but the particular book is not yet available there. I have not been able to find any other images of the page, nor have I been able to discover what archive the original is in. I will email the photos to Laura, though sadly they are still small. 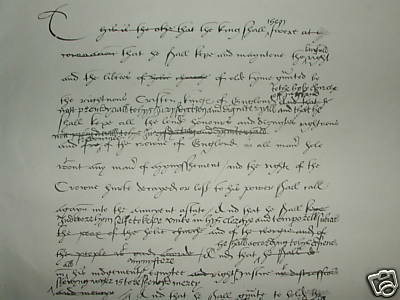 In my opinion, having seen firsthand many, many documents that are indisputably in Henry VIII's own hand, this document is not in Henry's handwriting. 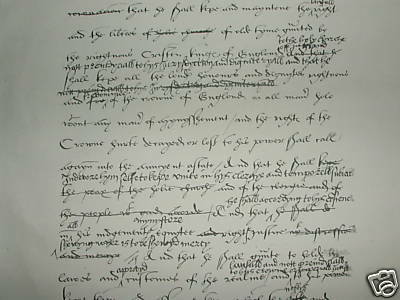 The script is absolutely typical of what is known as "sixteenth-century secretarial." I believe the document was certainly written by a secretary. If I can find the archive in which the original is deposited, the cataloguing data should confirm whether the handwriting is indeed Henry's or that of a secretary. As a tangential observation, it strikes me as decidedly improbable that any monarch would be directly involved in formulating his or her own coronation oath. Those matters are taken care of by the Heralds, the Archbishop of Canterbury, and the leading lords officiating at the coronation. The monarch "submits" to the oath, he does not dictate what it will contain. The base document is certainly a secretary's hand, but I could possibly be convinced that the edits were in Henry's handwriting - but it is really hard to tell from the small images. Roy Strong wrote a grand book "Coronation, A History of Kingship and the British Monarchy". It is full of information about the developement of the ceremony. 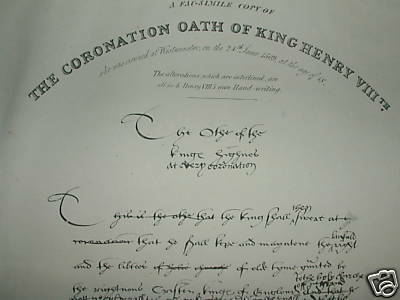 I did a quick skim, but there is nothing directly related to Henry VIII, in so far as him writing his own coronation oath. I was scrounging on the Internet I found a site called "British History Online." I searched for Henry VIII's coronation and it showed several references to coronation documents that came from "the Letters and Papers, Foreign and Domestic, of Henry VIII." I'm not citing them properly but JS Brewer was the editor; they were printed in 1920 and the coronation documents were from Volume 1, 1509-1514; pages 36-55. 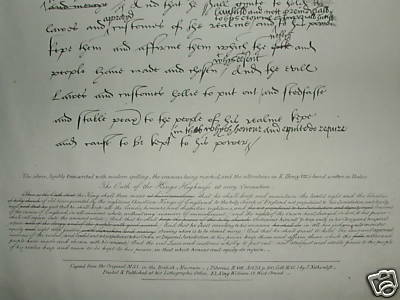 Hopefully that can help PhD Historian find where the actual document that Netherclift copied is located. "Letters and Papers, Foreign and Domestic" was printed from documents in what used to be called the Public Record Office, now the National Archives, as Kew outside of London.